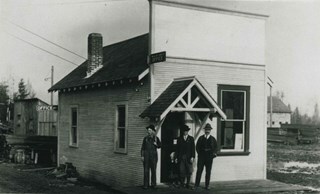 Photograph of the exterior of the building housing the Phillips, Hoyt Lumber Co. office with three men standing outside. 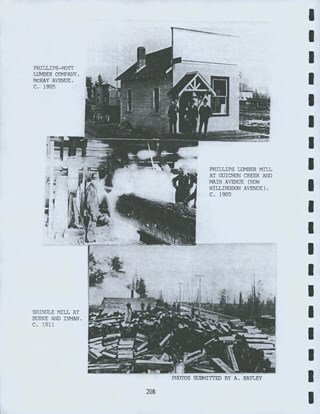 The building was located at 2730 McKay Avenue (old street numbering system) and the site is now a part of the Burnaby Public Library site. 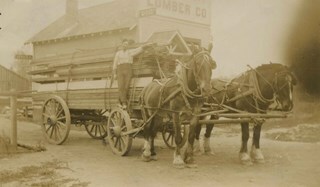 Photograph of the exterior of the Phillips, Hoyt Lumber Co. on McKay Avenue with three men standing in front. This property is now part of the Burnaby Public Library site. 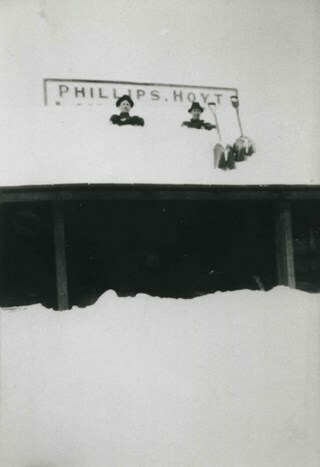 Photograph of a building of the Phillips, Hoyt Lumber Co. after a snowfall. Two men are on the roof of the building with shovels. 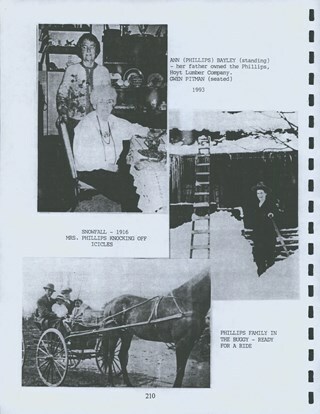 Collection consists of photographs of the Pitman family and the Phillips-Hoyt Lumber Company horse team, truck, office and sled (on McKay Avenue) and the Patterson Avenue Station as well as textual records collected by Gwen Pitman. Ernest Pitman owned a men’s furnishings store in Weston super Mare, England. He and Mary Jane “Jean” Gill were married in Cardiff, Wales and their children; Clifford, Dorothy, Marjorie and Gwendolyn were all born in Weston super Mare, England. 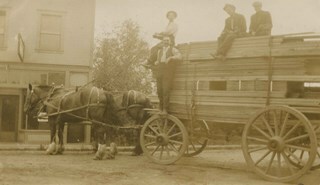 The family of six came to Canada in 1912, settling in Burnaby in 1914. Ernest Pitman had to clear the lot at 2766 Cassie of tree stumps before Mr. Mansell could build their wooden four room house. The family moved to Victoria in 1920, renting out the house on Cassie, and returning to it in 1922. The Pitman children attended Kingsway West School and Burnaby South High School. Ernest Pitman bought a dry goods store near the corner of McKay and Kingsway and renamed it McKay Dry Goods Store in 1926. The store enlarged when Lloyd’s Studio closed and included post-office, ladies and men’s wear, children and baby’s wear. The older children Dorothy and Gwen were the first employees; working at the store after school and on Saturdays. Clifford and Marge served through the years as well. McKay Dry Goods closed in the late 1950s but the structure still stands. Ernest Pitman opened his second shop; Jubilee Dry Goods and Men’s Furnishings in 1930 (the area was then known as Shacktown). 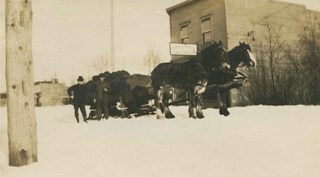 In 1935 the premises expanded to embrace the old Wray shoe store and post office. Jubilee was first managed by his older daughter Dorothy but when she married Dave Howat his second daughter Gwen took over as manageress. In 1961 Gwen Pitman won the Show Window Contest (in the small retail outlets category) receiving a prize of $100.00 from the Burnaby Chamber of Commerce. She continued to run the store until she closed it for the last time in 1971 and retired. The other children lived their adult lives in Burnaby as well; Clifford Pitman and his wife raised two boys on Rumble Street and Marjorie Pitman Everett and her husband raised three children in the Grange-Willingdon area. Ernest Pitman was the brother-in-law of Willard H. Hoyt of Phillips-Hoyt Lumber Company on McKay Avenue.